The Comgrenade is a CRNR experiment to give the capability of large area audio recon to ground personnel in all weather conditions. The current Comgrenade is designed to be human propelled, highly durable, technologically adaptable, and weather resistant. The prototype version of the Comgrenade is capable of being thrown up to a hundred yards. The football shell of the Comgrenade is a commercial nerf football. Because of the commercial purpose of the football, being both durable and capable of long distance flights from human propulsion, the project developers believed this to be the ideal shell for the initial versions of the Comgrenade. Incorporating commercial technology with CRNR group technologies has consistently been a core strength. The internal transmitter inside of the nerf shell can be replaced with many off the shelf transmitters. Being adaptable to many different current transmitters allows for a range of transmission distances, including satcom transmitters and scramblers. For prototype purposes, we have proven the use of a 2 mile transmitter, and a 1 mile transmitter that will be demonstrated at project Strong Angel. Most common receivers can pick up the transmission, and does not require special equipment. The receiver can then be transmitted into another transmitter, wearable interfaces, or even into a computer to allow for live streaming on computer networks. 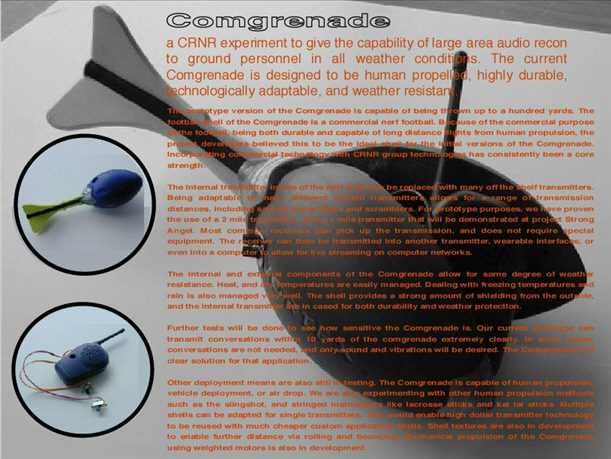 The internal and external components of the Comgrenade allow for some degree of weather resistance. Heat, and dry temperatures are easily managed. Dealing with freezing temperatures and rain is also managed very well. The shell provides a strong amount of shielding from the outside, and the internal transmitter are in cased for both durability and weather protection. Further tests will be done to see how sensitive the Comgrenade is. Our current prototype can transmit conversations within 10 yards of the comgrenade extremely clearly. In some cases, conversations are not needed, and only sound and vibrations will be desired. The Comgrenade is a clear solution for that application. Other deployment means are also still in testing. The Comgrenade is capable of human propulsion, vehicle deployment, or air drop. We are also experimenting with other human propulsion methods such as the slingshot, and stringed instruments like lacrosse sticks and kai lai sticks. Multiple shells can be adapted for single transmitters. This would enable high dollar transmitter technology to be reused with much cheaper custom application shells. Shell textures are also in development to enable further distance via rolling and bouncing. Mechanical propulsion of the Comgrenade using weighted motors is also in development.